A dystopian science fiction thriller, Snowpiercer shimmers with the story of human conflict and survival in a frozen future. In the near future, the release of an experimental chemical into the atmosphere to lower soaring temperatures due to climate change goes wrong. A new global ice age is immediately triggered and all life is exterminated. The only survivors are on-board Snowpiercer, a massive ark-like train designed for human survival by genius scientist Wilford (Ed Harris), who predicted the catastrophe. The train is powered by a perpetual motion engine and continuously circumnavigates Earth. Seventeen years pass. The tail section of the train contains "undesirable" passengers who clambered onto the train uninvited, and are now living in deplorable and overcrowded conditions. They include Curtis (Chris Evans), his friend Edgar (Jamie Bell), their spiritual leader Gilliam (John Hurt) and Tanya (Octavia Spencer), the mother of a young child. They are kept alive with daily doses of disgusting protein bars distributed by armed guards who separate them from the elites at the front. The train's snotty leaders are represented by the insufferable Minister Mason (Tilda Swinton). When the elites initiate the latest round of forcible child abductions from amongst the undesirables, Curtis, Edgar and Gilliam spark a violent uprising with the intention of storming the front cars and taking control of the train. To pry open the security gates the rebels will need to work with expert gate control designer Namgoong (Song Kang-ho) and his 17 year old daughter Yona (Go Ah-sung), who are both drug addicts. 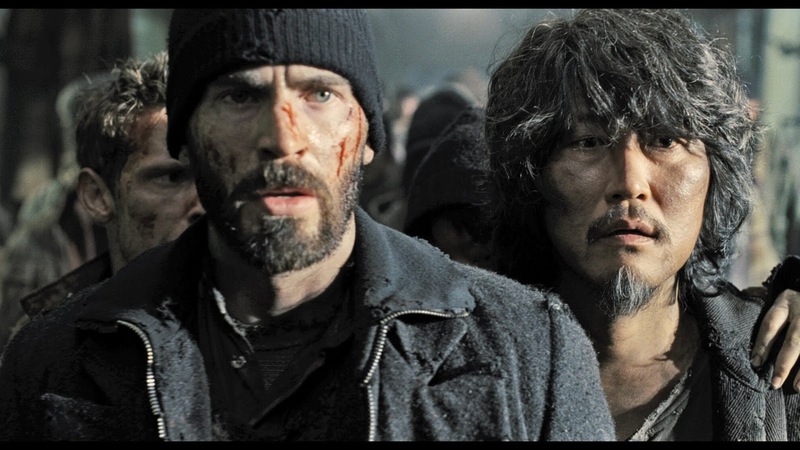 The first English language film directed by South Korea's Bong Joon-ho (who also co-wrote the script), Snowpiercer is a stunning cinematic achievement. Mixing human drama with expertly crafted thriller elements and superlative action scenes, the film offers unrelenting entertainment based on the French graphic novel Le Transperceneige. The set-up is efficient and compelling. Curtis and his cohorts are introduced and framed as oppressed third class citizens of the train, fed-up with mistreatment and confinement. They each have a background and a story to tell, but collectively they are at the end of their rope and ready to risk everything to overthrow the current order. Once the storm-the-train plot is set in motion, the action is incessant and drives forward in tandem with the rebels as they progress towards the front. Pitched battles are fought in confined quarters, tactical surprises are sprung and acts of heroism abound. The gore is kept to a manageable level, but there is no mistaking the intensity of this fight for control and dignity. As the fate of the rebellion ebbs and flows in each successive cabin, the internal and external set designs offer a feast for the eyes and the mind. The ragtag rebels are suddenly exposed to the middle class cabins, including the water manufacturing plant, restaurant services (complete with sushi bar), children's school classes, an aquarium for harvesting seafood, and copious quantities of beef. They also unhappily stumble upon the source of their protein bars. Meanwhile, as the unstoppable train streaks through the landscape, the glimpses of outside scenery are breathtaking. The Earth is reduced to one destroyed and uninhabitable ice field, the beauty of absolute frozen whiteness juxtaposed with the horrific absence of life. Snowpiercer is an allegory for social structures and interdependencies, visiting the terrain of Animal Farm and 1984. Who gets to lead, who gets to be exploited, the symbolism of the all-powerful godlike leader and how the head and the tail interact - or not - for the greater good are familiar themes, but rarely has a film dealt better with eternal existential questions about the collective human condition. Chris Evans find one his best career roles as reluctant rebel Curtis Everett. Evans gets to combine brains with brawn as Curtis steps up to the role of frontline leader, and he emerges as a bonafide circumspect protagonist. 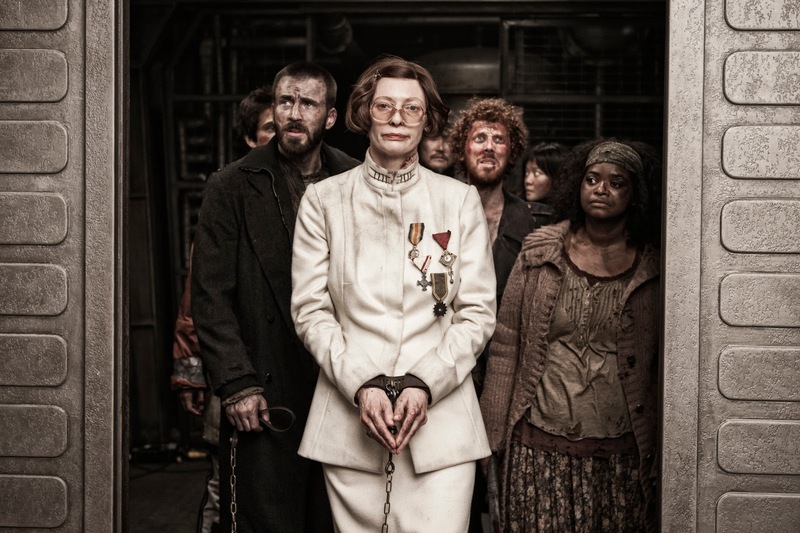 Tilda Swinton as the conniving Minister Mason is the other standout performer. Curtis' disruptive actions open Snowpiercer's doors literally and figuratively, and as always, it's up to every individual member of a social order to choose which of the available doors to walk through, with consequences ranging from inspirational to disastrous. You're a lot nicer to this than I was. I think this fails on the verisimilitude test on just about every level. Because of that, I just couldn't get into it. Yes, this one sharply divides opinions. I was happy to imagine that the unanswered questions had an explanation elsewhere, and I just allowed the film's stylish momentum to wash over me.